EPA issued two important announcements regarding changes to or reevaluation of significant regulatory programs applicable to fossil fuel-fired electric generating facilities. First, during the Obama administration, EPA had promulgated new wastewater discharge effluent standards applicable to power plant discharges, including from bottom ash and flue gas desulfurization systems. Electric generators had objected to the rules and sought reconsideration of the final standards based upon both costs and technical feasibility. Under the Trump administration, EPA has agreed to re-evaluate these standards, and had separately announced its intention to publish proposed revisions to the requirements. EPA has now determined to postpone for two years the applicability dates under the current rule while the agency separately pursues regulatory revisions to the substantive requirements. This formal regulatory action to amend the compliance deadlines follows EPA’s prior announcement to administratively stay the compliance dates under the rule while it evaluated regulatory options. 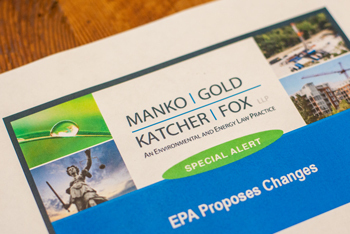 Environmental organizations had challenged the legal propriety of the stay, and EPA has now sought to avoid any dispute concerning those challenges by addressing the compliance extension through a formal regulatory action. In the context of the underlying litigation challenging the coal ash regulation, the D.C. Circuit Court of Appeals chose not to grant EPA’s request to hold the litigation in abeyance during EPA’s reconsideration of the regulation. Instead, the Court postponed until November 20 the oral argument that had been scheduled for October 17. The Court seeks additional briefing to determine how best to proceed with the litigation while EPA undertakes to reconsider the regulatory standards. For further information, please contact Bart Cassidy at bcassidy@mankogold.com or 484-430-2306.